The Drum Corps International Tour is finally here! The entire 115-event series kicks off this Saturday in the Lone Star state, and if your personal level of excitement has been slow to build, here's a list of things to put you in a feverish frenzy for the opening weekend of the 2011 summer season. For the very first time in Drum Corps International history, the top eight corps from last year's World Championship will start the new season together as they go head-to-head in two season-opening events in Texas. In any previous season, it sometimes took several weeks for West Coast corps to meet up with their East Coast counterparts. This season, the pressure is on from day one with the World Champion Blue Devils' two-season undefeated streak on the line, and a bevy of other top corps looking to come out strong competitively from the start. Both corps and fans alike are sure to be on pins and needles anticipating the outcome of the first events of the summer of 2011—as well as those that follow. It all gets started on Saturday, June 18 in the Ft. Worth area, as the Blue Devils, Cavaliers, Bluecoats, Carolina Crown, Cadets, Phantom Regiment, Santa Clara Vanguard and Blue Stars square off at Saginaw High School. The same eight will head to Austin the next night to do it all again at the Kelly Reeves Athletic Complex. Learn more about the DCI Ft. Worth event. Learn more about the DCI Austin event. The official scores from the DCI Ft. Worth and DCI Austin contests will not be released to the public—or the corps—until Monday night. DCI's brand new cinema event, the 2011 Tour Premiere, is coming to movie theaters nationwide on Monday, June 20. To add a new level of excitement to this unprecedented season-opening weekend, competitive scores from Ft. Worth and Austin, will remain unknown to the corps, the public, and the rest of the drum corps universe; and will be kept in a secured location, locked away from all but DCI Executive Director Dan Acheson until the broadcast is readied for digital satellite distribution to theaters from coast to coast. Scores from both events will be revealed exclusively at the conclusion of the Tour Premiere, which will be taped live in Austin and broadcast in high definition to more than 400 theaters on Monday. Though official scores will be held until Monday, fans attending the season-opening events on Saturday and Sunday in Texas, will have the power to pick those night's respective winners! At the end of each event, audience members will be able to vote via text message, allowing them to rank each of the eight performing corps. Fan votes will be tallied and announced after drum majors come back onto the field at the finale of the events in Ft. Worth and Austin. Can't make it to Texas in person? Here's the next best thing! DCI's first of two summer cinema events will be coming to more than 400 movie theaters across the nation on Monday, June 20. This first-ever 2011 Tour Premiere will be taped in Austin and broadcast to drum corps fans hungry for some early-season drum corps action. Hosted by veteran DCI broadcasters Steve Rondinaro and Dennis DeLucia, the Tour Premiere will feature inside looks at the repertoires of the entire field of World Class performing corps, along with interviews with show designers, and glimpse ahead at the entire 2011 summer season. Never before has the season-opening performances of the annual DCI Tour been brought to a national audience! Be there to witness history in the making! Find a theater in your area, and order your tickets in advance. After this weekend's kickoff competitions in Ft. Worth and Austin, there are 113 more exciting events to go! The 2011 Drum Corps International Tour will be coming to 40 states across the country this summer, featuring more than 45 corps and 57 days of the best of Marching Music's Major League;™. While the competition heats up and the action has its twists and turns, one thing is for sure; an entire summer of fun-filled excitement is ahead for everyone. See you in the stands! 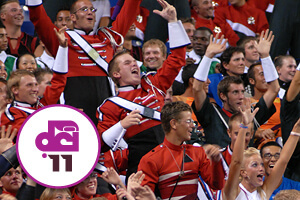 View the complete 2011 Drum Corps International Tour schedule.